Background: A diet rich in fruits and vegetables is associated with reduced risk of diet-related chronic diseases. However, fewer than half of children in the United States consume the recommended amount. Objectives: This article describes the community-based participatory research (CBPR) process used to develop the Harvest for Healthy Kids curriculum. Methods: Harvest for Healthy Kids is a intervention research project designed to increase access to and intake of fruits and vegetables among preschoolers enrolled in Head Start. The curriculum is composed of eight kits, each focusing on a different fruit or vegetable. Results: The Harvest for Healthy Kids curriculum was developed through an iterative process in which Head Start teachers were highly involved. The final product reflects the teachers’ experiences using the curriculum and their suggestions for improving. Conclusions: The CBPR process used to develop the Harvest for Healthy Kids curriculum led to a product that is grounded in theory and practice. Izumi, B. T., Peden, A. M., Hallman, J. A., Barberis, D., Stott, B., Nimz, S., ... & Capello, A. (2013). 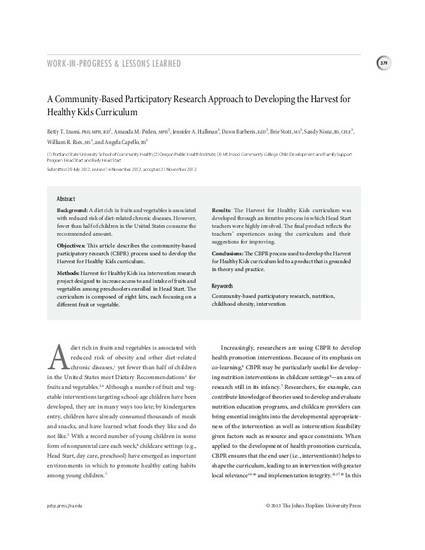 A community-based participatory research approach to developing the Harvest for Healthy Kids curriculum. Progress in community health partnerships: research, education, and action, 7(4), 379-384.